Celebrating David Gilmour's 70th birthday with 7 vintage video clips - Fat Old Sun, Money, Another Brick in the Wall, Learning to Fly, On the Turning Away, Keep Talking, Arnold Layne (with David Bowie). New septuagenarian senior citizen, baby boomer, and rock singer (Pink Floyd), songwriter and guitarist David John Gilmour, CBE (Commander of the Order of the British Empire), was born March 6, 1946 in Cambridge England. Gilmour was an early fan of rock and roll, Elvis Presley and the Everly Brothers, which inspired him to begin to teach himself to play guitar at age 8. In 1957, 11-year-old David Gilmour first met fellow budding musicians Roger Waters and Syd Barrett, who attended a nearby high school. Gilmour joined the rock band Jokers Wild in 1962 and they recorded an unsuccessful single; he later busked in Europe with guitarist Syd Barrett and friends in 1965, again not successfully. Barrett (songwriter and guitarist) returned to England and together with Roger Waters (bass guitar), Nick Mason (drums), and Richard Wright (keyboards), formed the rock group Pink Floyd. Meanwhile, Gilmour worked odd jobs to support himself and with two other ex-Jokers Wild bandmates, tried forming a new group in France in 1967; once again, success eluded them. The tide began to turn for David Gilmour in December 1967 when he was back in England - Nick Mason asked him to join Pink Floyd as their guitarist. Shortly after, Syd Barrett (who had mental health issues, perhaps because of LSD use) left the group and Gilmour began sharing lead vocals for Pink Floyd with Roger Waters and Rick Wright. While on tour in the U.S. in 1971, David Gilmour met American model Ginger (Virginia) Hasenbein backstage at a Pink Floyd concert with her boyfriend of several years. Ginger has described their meeting as "love at first sight". According to Comfortably Numb: The Inside Story of Pink Floyd (written by Mark Blake, 2008), within two weeks David and Ginger were living together in England. Despite the success of the Atom Heart Mother album, Pink Floyd didn't have any singles on the Top 100 charts from it. When their eighth album The Dark Side of the Moon (1973) was released and went to #1 in the U.S., that changed. The single Money (1973) written by Roger Waters and performed by Pink Floyd with David Gilmour on guitar, with the B side the musical composition Any Colour You Like (1973) written by David Gilmour, Richard Wright and Nick Mason, made it to #13 in the U.S. - although it failed to break the Top 100 chart in the U.K.
Below, Pink Floyd with David Gilmour, performing Money live in 1988, Gilmour singing the lead vocals & guitar. David Gilmour and Ginger Hasenbein were married in July 1975, and their wedding reception was held at Abbey Road Studios, where many Pink Floyd tracks were recorded. Pink Floyd's sixth album -Wish You Were Here (1975) - also reached #1 in the U.S. and the U.K., but failed to yield any Top 100 hit singles. 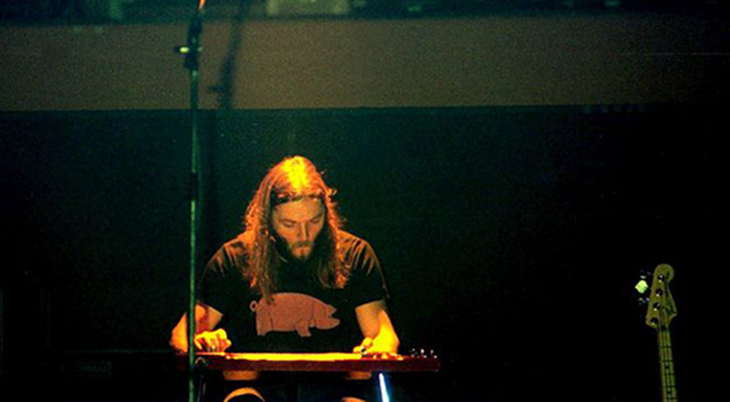 Below, David Gilmour on the steel lap guitar in 1977. The following year David and Ginger celebrated the birth of their first child, daughter Alice (b. 1976). More Pink Floyd albums and a solo album David Gilmour (1978) followed in the next couple of years. In 1979, Ginger and David Gilmour had their second daughter, Claire. Below, David Gilmour is interviewed in 1977. By the mid-1980's, David Gilmour had released his second solo album About Face (1984). His third child, daughter Sara had been born the year before, when Pink Floyd's ninth album The Final Cut (1983) was released. A significant for both Pink Floyd and David Gilmour occurred when Roger Waters left the band in 1985 - beginning years of battling between the other Pink Floyd band members and Waters over name and song rights. David and Ginger Gilmour had their fourth child, son Matthew, in 1986. The next year, Pink Floyd embarked on a world tour to support their 13th album, A Momentary Lapse of Reason, bringing along backup singers that included Rachel Fury (Brennock). By the time the Pink Floyd tour was over in 1989, Ginger and David Gilmour had separated and Gilmour's name was linked with that of Rachel Fury; he had also begun using cocaine and embracing the party lifestyle. David and Ginger Gilmour's divorce was finalized in 1990. 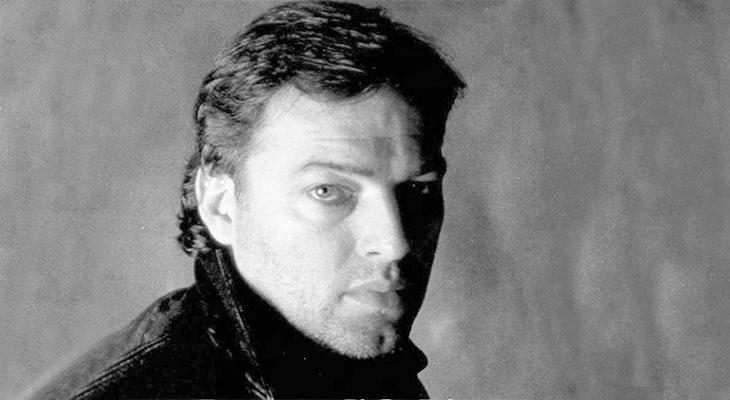 Under the leadership of David Gilmour, the album A Momentary Lapse of Reason (1987) yielded 3 top 10 chart hits in the United States. 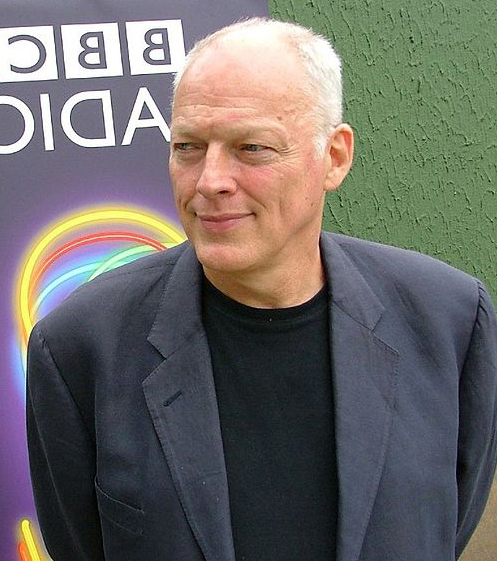 All the songs on the new album were written or co-written by David Gilmour. The #1 hit single Learning to Fly (1987), co-written by David Gilmour, Anthony Moore, Bob Ezrin, and Jon Carin, is in part based on the changes within Pink Floyd, and on Gilmour's experiences. Below, the official music video for Learning to Fly, which was filmed on a mountain in Kananaskis, near Canmore, Alberta; it won the MTV 1988 Video Music Award for Best Concept Video. The second #1 single from the A Momentary Lapse of Reason album was the power ballad On The Turning Away (1987) written by David Gilmour and Anthony Moore. Below, Pink Floyd live in 1988 with David Gilmour on guitar and lead vocals, singing On The Turning Away. In the 7 years before the next Pink Floyd album came out, David Gilmour married again. He'd met a young, divorced mother of one and freelance journalist called Polly Samson at a dinner party; it took a couple of years before he asked her out, and they began dating. In the Pink Floyd biography by Mark Blake, he says Gilmour agreed to stop taking cocaine when they began dating. Gilmour encouraged Samson to write some songs for Pink Floyd, and when the royalty income began to kick in a couple of years later and she felt she had some financial independence, she accepted his proposal. They married in 1994 and Gilmour adopted her son Charlie Williams (b. 1991). Gilmour is a pilot and has owned several airplanes, even starting an airplane leasing company called Intrepid Aviation (since sold to new ownership). Pink Floyd's 14th album, The Division Bell (1994) was released and became a #1 U.S. album. Polly Samson co-wrote 7 of the songs on the album with David Gilmour, including the #1 US hit single, Keep Talking (1994). Below, Pink Floyd performing Keep Talking, written by David Gilmour, Polly Samson and Richard Wright, live in 1994. Polly and David Gilmour's son Joe was born in 1995, the same year the live Pink Floyd album Pulse was released. Pulse was recorded during The Division Bell tour and became a #1 album in the U.K. and the U.S.; it contains all the songs from Pink Floyd's The Dark Side of the Moon album. During his 50+ years, son Gabriel (b. 1997) and daughter Romany (b. 2002) completed Polly and David Gilmour's family; together with his four children from his marriage with Ginger, David Gilmour now has 8 children. 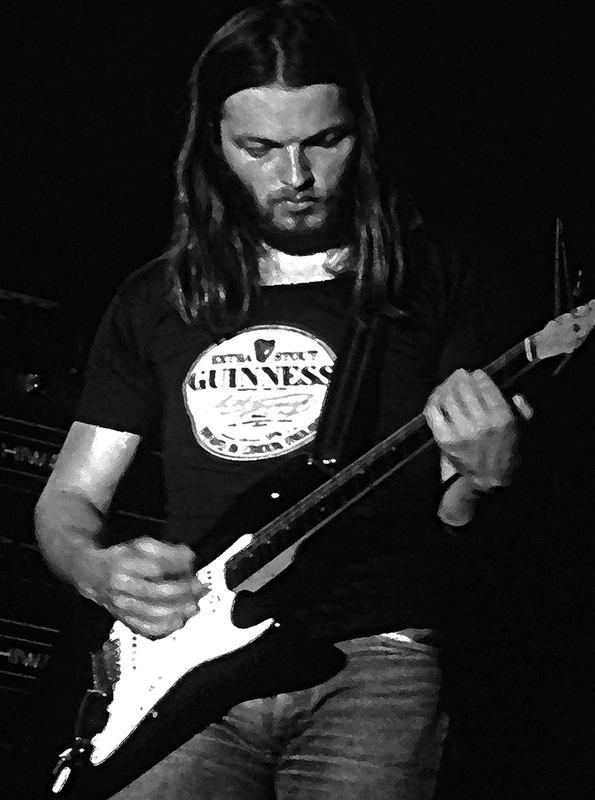 While Pink Floyd was on hiatus after their Pulse was released, Gilmour released more solo albums. His studio album On An Island (2006) made it to #1 on the U.K. album charts and #6 in the U.S. David Gilmour also released a live album Remember That Night (2006), which was recorded during the concert tour for On An Island. The only single from these two albums to crack the Top 20 chart was David Gilmour's cover of Arnold Layne, from the live Remember That Night album. Originally written by Pink Floyd founder, songwriter and vocalist Syd Barrett before he left the group, Arnold Layne had been released back in 1967 and was banned at the time due to it's subject matter (transvestism). Below, David Gilmour performing Arnold Layne with David Bowie. Pink Floyd's last studio album, the mostly-instrumental The Endless River (2014) went to #3 on the charts, but contained no hit singles. The following year David Gilmour - now a senior citizen - released his fourth solo studio album, Rattle That Lock (2015). The album was a #1 U.K. and #5 U.S. chart success. With 3 of the original 4 founding members of Pink Floyd gone - Syd Barret left in 1968 and died in 2006; Roger Waters left in 1985; and Rick Wright died in 2008 - Gilmour confirmed in 2015 that Pink Floyd will not be reuniting. In addition to his duties as lead singer and guitarist for Pink Floyd, over the years David Gilmour had also worked on a variety of side projects with other musicians and bands such as Elton John, Eric Clapton, Bob Dylan, The Who, Levon Helm, Bryan Ferry, and others. A gifted musician, in addition to guitars, Gilmour plays many instruments including keyboards, synthesiser, mandolin, banjo, harmonica, drums, and saxophone. "I can’t relate now to the dedication and religious fervour of youth. But something’s lost and something’s gained in living every day, as Joni Mitchell would say. I am in some ways wiser, more knowledgeable and better at doing things. So hopefully all that goes into the music." Septuagenarian senior citizen David Gilmour can be seen live in concert in 2016, as he completes his North American tour in support of his Rattle That Lock album. Happy 70th Birthday, David Gilmour!